1. Task List: Track your daily tasks, people to call, errands to run, people to e-mail and things to buy all in one convenient list! 2. Grocery List: Use this list to keep track of food you need to pick up at the grocery store. Organized by sections of the grocery store it helps remind you of different categories of items you may need as well as providing a simple checklist to use while in the store. Post it on your fridge for the whole family to add to throughout the week. 3. Meal Planning List: Plan healthy eating for you and your family with our meal planning list. 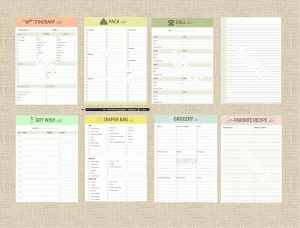 Use it as a weekly sheet to outline breakfast, lunch, dinner and snacks. A tear off shopping list is included to quickly jot ingredients you may need to complete your recipes. 4. Favorite Recipe List: Finding recipes you love and want to remember where to find them? Use our template to track the name of the recipe and its location on the web, in a book or in your house so you can easily refer to it for inspiration and to jog your memory. 5. Notes Pages: Everyone needs some blank pages for brainstorming and writing thoughts. Use these pages for journaling, listing, or doodling. 6. Recipe List: Use this template to write down and share your favorite recipes. There are sections for the source, prep and cooking times, ingredients, cook’s notes and preparation outlines. 7. Pantry List: Do you frequently loose items in your pantry and buy multiples? Use this list to track what is in your pantry and how much you have in stock. 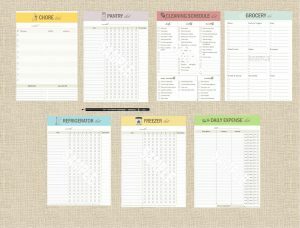 Works great to help you quickly scan your inventory when you are planning meals for the week. 8. Refrigerator List: Is it hard to see into the back of your fridge? Use this list to track what is in your refrigerator. Works great to help you quickly scan your inventory when you are planning meals for the week. 9. Freezer List: Do you have frozen food you keep forgetting to use? This list will track what is in your freezer and how much you have in stock. Works great to help you quickly scan your inventory when you are planning meals for the week. 10. Diaper Bag List: Use this template as a quick checklist before you leave the house with your kids. Laminate it for reusable surface. Never forget diapers again! 11. Password List: Do you always forget your passwords? Use this list to track your passwords. Sections to list the website, username, password and any notes you need to remember, such as security questions. 12. Call List: The call list helps you track messages you need to return throughout the day. Never forget to call back a colleague or a friend again with this handy template. 13. Address Pages: No planner would be complete without a spot for your contacts. Print as many address pages as you need to keep track of your friends, family and colleagues’ addresses, phone numbers, e-mails and more. Need to update a persons address? Don’t worry about crossing out information, just print another page for an orderly address book. 14. 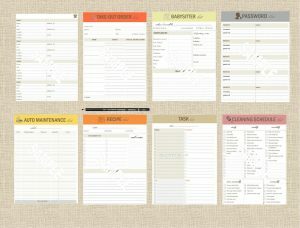 Take-Out Order List: Use this template to help you track your take-out orders at home or at work. Places to put restaurant information, order totals, whether it will be picked-up or delivered and what each person orders. Save it as a record for reorders in the future too. 15. Auto Maintenance List: Keep this list in your car or in your planner to track spending on repairs and maintenance for your vehicle. 16. Babysitter List: Use this list to give your babysitter all of the important information they will need while you are gone. You can laminate to reuse or print a new one each time. 17. Birthday List: Track all of your family and friend’s birthdays by month. This will make sending cards and well wishes much easier each month. Stay ahead of the schedule with this convenient template. 18. Bill Pay List: Use this easy template to write down your bills and check off when you pay them each month. 19. Monthly Budget List: This list will help you track your expenses each month. Template includes areas for income sources and common household/business expenses. There are also blank areas to add your own categories. 20. Chore List: Get those family members to work! 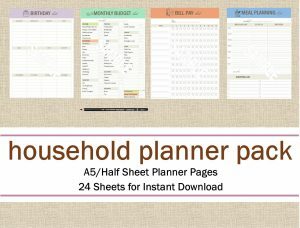 Note the chore, who’s responsibility it is and track supplies on hand as well as those needed all in this simple sheet. 21. Cleaning Schedule: Need reminders to help you with your cleaning schedule. This template helps you remember what to do daily, weekly, monthly, annually, and semi-annually. Just follow the checklist and you will have a sparkling house. 22. Pack List: This template helps you remember what to pack for each trip by category. Use a new one each time or refer to one you have filled out to make packing less of a chore. 23. Itinerary List: Help family members and house sitters remember your travel plans with this easy template. Use it as your cheat sheet to remember confirmation numbers, hotels, flights, and phone numbers while on the road. 24. Daily Expense List: Want to see how much you spend in a day? Use our daily expense list to track purchases, categorize them and note how you paid them. Great personal or business use. 25. Gift Wish List: Keep track of all your family members’ gift wishes throughout the year to make buying for birthday’s and holidays easier.